... I've never really tried it. So I thought I should. And the Shabby and Vintage challenge over on the Moxie Fab World blog gave me the perfect opportunity! I made this card using one of the stamps from THIS cute Hero Arts set. Love it. I mixed it with some Lily Bee 'Lovely' papers, and a scrap of fabric I had lying around. The sentiment is from THIS set, and I stamped it using THIS ink. I'm sure I should have used Staz-On, but this ink worked fine. (I've never succeeded much with Staz-On... not sure why. Is there a trick to it?). I do love making cards with twigs on. Especially when they are from my tree. P.S. Is the new blog design OK or is to too cluttered? I'm on full alert for anything CHA related. I love to see new products (and buy them). First, your card is awesome.. It took me some minutes to enjoy it. 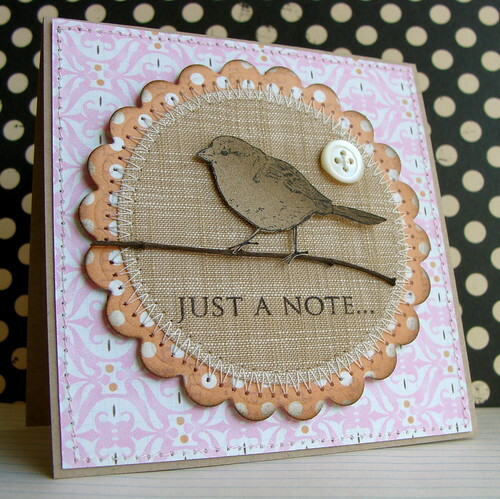 Great work on the fabric, Lucy..
Gorgeous card Lucy...Love the use of fabric. The card is lovely, anyone would be excited to receive it. I love the use of the twig also. I recently made a rustic star from twigs for my home. Blog looks very nice too. LOOOVE THIS!! The twig is a sweet addition! A friend just reminded me to pull out all that old cross-stitch linen from years ago and stamp on it - seeing your results, I'm going to try that next! So gorgeous love your beautiful work!!! your blog re-design looks fabulous lucy! love your card too! just lovee these natural colours and textures and the addition of that very fine twig is perfect! Oh I just love the use of twig on a card! Looks fabulous! Also think you've mastered the Shabby and Vintage style perfectly! I too wish I was at CHA! Can't wait to see what's happenin' over there! Great card and wonderful new look to your blog, love everything bigger! LOOOOOOOOOVE this card! Such pretty colors and what a great job stamping on fabric. I can never do it right! LOVE IT! Oh what perfect stitching - how do you do it!! So many lovely elements on this card - its absolutely fabulous! This is just gorgeous! I totally wish I was at CHA! love the twig! lovely card! wish i was at CHA.... sigh... hope i can go to one some day... have you seen the Cosmo Cricket previews/sneaks that Debbie Olson has been doing? they all look so yummy!! =) great new look on your blog, too! 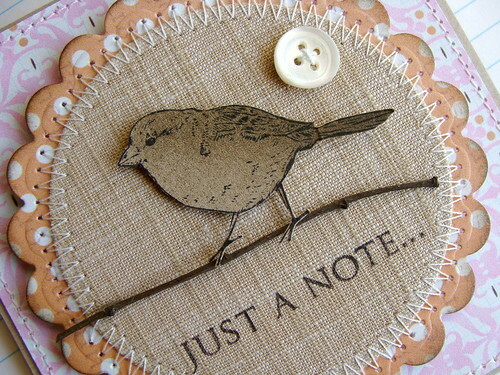 the fabric is a perfect background to the little bird, and the twig is perfect! Beautiful!! Perfect in every way! Gorgeous, Lucy. i am just in the middle of making a "twig" card too. Blog looks fine :) As soon as I opened something struck me as different but not "cluttered". Super cute card...love the fabric. Stazon is great for metals and slick surfaces, although you need a steady hand. Also, like the new layout, it is not too cluttered! Oh I love this card Lucy. That bird is so cute and even better with his little twig. I must 'borrow' that idea from you, I just love it. Your papers and that fabric are so good together. Oh Lucy! This is just perfect. I love the addition of the twig, and what a cute bird!! Gorgeous card, love the stamping on the fabric, also was wondering if fabric can be cut with my cuttlebug and spellbinder dies? how do you cut yours? oh WOW what a great card and such a unique idea! Enfys is the only person Ive ever seen do this before. I have to agree, the natural theme of the image and g=fabrics and the twig really add to the beauty of it. YOu can definitely see all of the work thats gone into this. Love your new blog design--not cramped at all! And your fabric stamping is wonderful! Your stitching always floors me! So simple and clean and yet totally STUNNING! Gorgeous!